Victoria Vega, a senior at Moore Catholic High School and the 2010 “Gullickson McGuire Memorial Scholarship” recipient, was approved for the Gold Medal that is the highest level awarded by The Congressional Award Program. Victoria, who is an inductee into the National Honor Society and is a First Honors Student in the Presentation Scholars Academy, volunteered as a peer tutor at Moore Catholic and volunteered as an administrative assistant at the NYPD Satellite Office as well as an assistant coach at Saint Teresa’s Basketball and Baseball Clinics. Jessica Halter, a junior at Moore Catholic High School and a 2011 “Gullickson McGuire Memorial Scholarship” co-recipient, was also approved for the Gold Medal. Jessica, who is an inductee into the National Honor Society and a Principal’s List Student in the Presentation Scholars Academy, volunteered at Meals on Wheels assisting with deliveries and at Walker Park Summer Day Camp as an assistant counselor. Jessica was also a member of the Moore Catholic’s Art Club. Jordan Marino, a junior at Moore Catholic High School and a 2011 “Gullickson McGuire Memorial Scholarship” co-recipient, was approved for the Silver Medal. Jordan volunteers at the Theater Group and Summer Camp for Holy Rosary Parish. Jordan is also an active volunteer with the Staten Island Special Olympics. 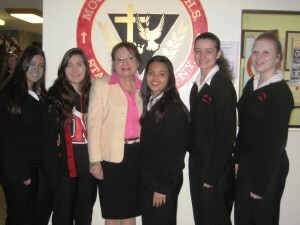 Sarah Primiano, a sophomore at Moore Catholic High School, who is a First Honor’s Student in the Presentation Scholar’s Academy and the 2012 “Gullickson McGuire Memorial Scholarship” recipient, was approved for the Bronze Medal. Sarah volunteered at YMCA Day Camp in West Brighton and with 436 Family Readiness Group that supports our military. Sarah is active in Dance and Band where she is a flute player at Moore Catholic. Ryan Buraus, a sophomore at St. Peter’s Boys High School and the 2012 “Terry Sweeney Memorial Scholarship” recipient, was approved for the Bronze Medal. Ryan is a student in Saint Peter’s Honors Program where he consistently achieves First Honors throughout his freshman and sophomore years. Ryan is a member of the Student Council, the LaSallian Youth Group, wrote articles for the school’s newspaper “The Eagle” and is a member of the school’s bowling team. He is also a life scout in the Boy Scouts with Troop 7 and is working toward becoming an Eagle Scout. Thomas Walsh, a sophomore at St. Peter’s Boys High School and the 2012 “Coach Bill Hodge Memorial Scholarship” recipient, was approved for the Bronze Medal. Thomas is a student in Saint Peter’s Scholars Program where he consistently achieves First Honors throughout his freshman and sophomore years. 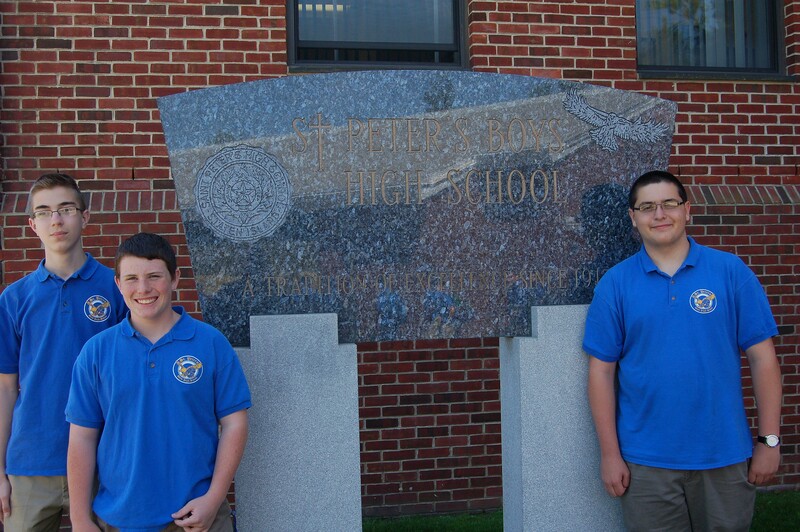 Ryan is a member of Saint Peter’s Football, Baseball, Swimming, and Bowling teams. Thomas attended a Congressional National Young Leaders Conference in Washington DC. He is also a member of the Saint Peter’s Interact Club that is affiliated with the Mid-Island Rotary and volunteers at High Rock Park. John Borovilas, a senior at Brooklyn Technical High School and National Honor Society Member, was approved for the Silver Medal. John volunteered in a lab with the Institute for Basic Research in Developmental Disabilities that focused on finding a possible cause and cure for autism. John also volunteered 54 hours as a Chemistry tutor at Brooklyn Technical High School. For an expedition trip, John explored the Appalachian Mountains where he visited a Cherokee Indian Reservation and zip lined over 200 foot deep ravines.